Divine intercession miracles are emblematic during this holiday time of year. Oil that burned days beyond expectation and the birth of a son to a virgin are among the highly celebrated. While we often define a miracle as an otherworldly event marked by divine intervention, Merriam-Webster also cites a miracle as "an extremely outstanding or unusual event, thing, or accomplishment." While not Testament-worthy, this month's blog reflects on a congregation of assorted professionals each of whom went so far above and beyond the call of duty. Their skills transformed a dire situation profoundly altering the lives of 2 very special people in a exceptionally short time frame. This story is also about a daughter's love and dedication for her mom and her perseverance when unwittingly thrust into a undesirable scenario. Whether there was a higher power at play in what you are about to read, I have no conclusions one way or another. I only know that what began with deep despair evolved into a truly remarkable accomplishment. [This blog was not only printed with permission from my client who at first was reluctant to divulge photos or discuss the situation, she sanctioned me to tell this account in hopes that it may help others in similar circumstances]. In early October I received a telephone call from a woman seeking assistance to help her mom relocate. She was referred to me by a dear colleague of mine, a woman who has mentored me in so many ways since the launch of The Practical Sort. My colleague's schedule was full so she passed along the referral. Lynn began by telling me that she did not know where to turn after some failed attempts to secure services for her mom. She explained that the situation was serious, and that her mom was highly distressed after the movers she employed walked off the job before they began. Lynn suspected that her mom's home was in a worrisome state, possibly hoarding. My first thought was to immediately excuse myself from this situation. I am not qualified to work with on-going hoarding clients. And after my first (and last) experience with a hoarding clear out as an assistant to my mentor, I decided that even hoarding clear outs were not my scene. However, I could hear the desperation in Lynn's voice and agreed to meet with her at her mom's condo. Lynn does not know this, but before I arrived, I had already decided that I would not take the job if it involved hoarding. 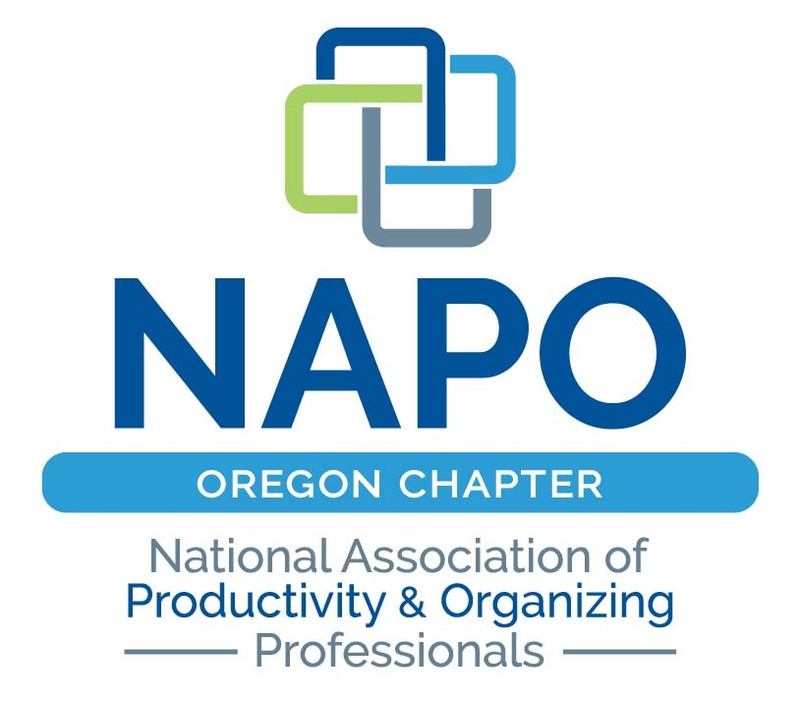 My goal during the on-site assessment was to determine which of my National Association of Productivity and Organizing Professional (NAPO) colleagues would be best suited to recommend knowing that few accept these jobs and my already booked mentor was one. My resoluteness began to wither when Lynn greeted me outside the condo with a hug filled with the intensity of a disconsolate daughter. I knew at that moment to expect the worst. Inside the door sat her mom on her recliner. Immediately I suspected that she was less than thrilled that I was in her home. Even Lynn had no idea of the state of the condo until recently as she had not been permitted entry. I understood at that moment the magnitude of her emotions. Had Lynn known, she would have intervened much sooner. I took her mom's hands in mine and introduced myself and asked her permission to take a look around. I also asked if I might photograph the rooms as I do with all of my clients' homes for my own reference. They had already declined permission to use the before and after shots for my website, so I assured her they would be for my own use. She agreed. Slowly I tackled my way through the small pathways that were carved from the living room into the adjoining rooms occasionally tripping on one thing or another, but held my balance each time. If I was having difficulty navigating how did an elderly woman with a walker manage? With each step I took, my heart sunk deeper and deeper and with each breath the stench became more unbearable. This was much more serious than I even suspected. The kitchen had no access and rotted food lined the countertops, floors, appliances, and cupboards. The toilet was unreachable blocked by piles of clothing. The master bed had no linens and inaccessible. The craft room was piled so high with storage containers and craft supplies that I did not bother to venture in. Lynn already knew what I was going to say, she had to get her mom out of here without delay. The circumstances were terribly unsafe and unsanitary. Fortunately they already had a lease on an apartment so despite mom's resistance to leave her home, they had a safe outlet for her. Lynn also came to terms that her mom needed on-going care far beyond what she could provide. The goal was to get the condo to market by the first week of November. Considering the gravity of the situation, I gently informed Lynn that might be an unrealistic expectation. Each time I considered ways to let her know that I was not right for the job, I saw the look in her eyes crying out for help. My head was swirling with all the tasks that needed to be done and the specialists with whom I would need to get on board to make it happen. With extreme trepidation, we scheduled an appointment the following week to begin clearing the place out. She and I donned masks and gloves stripping away at the piles for nearly 7 hours with a minimal break. At the end of the day, Go Trashy would make the first of 8 trips to haul away items after sating the complex recycling and trash dumpsters. I have lost track of how many days she and her husband toiled on their own having made mind-blowing strides each time I returned. Without delay, I began lining up contractors for Lynn to interview on October 24. The universe was on our side. All had availability to meet with us one after the other and some simultaneously so that Lynn could avoid paying me to be on-site additional days. A pest control inspection was followed by the packing/moving company, handyman, realtor, carpet installer, and house cleaner. She and I divided and conquered the six-ring circus. Surprisingly no rodent infestation was detected only spiders and fruit flies. The moving rep confided that his crew would likely also walk off the job unless we restored hygienic conditions. The handyman nodded through my to-do list which would eventually grow each time he came to the condo. I was hesitant to bring the realtor in before the clean up fearing her reaction, but she reassured me that she has seen equally awful conditions and had faith that we could deliver her a market-ready home. The carpet installer was insistent that his floor treatment and new wall-to-walls could be done on time along with a new toilet that he had in stock. And finally, I had every confidence in the house cleaner to conjure her magic. After hearing the mover's concerns, she offered a Saturday wet-vac service to get the carpets in as hygienically acceptable state as possible. She also agreed to wipe down the dust-covered furniture and rid the windowsills of the layer of bug carcasses to allay scaring off the movers. All of the parts and pieces had to move in precision in order for each contractor to perform their services on their scheduled date. I also needed to find a company to carefully relocate a grandfather clock that had been in her family for generations. Having grabbed a photo of the clock during my assessment, a local clock company was able to identify the clock maker. They coincidentally specialize in moving and restoring that brand. Then Lynn requested that I purchase all new appliances. By the time we would finish, the condo interior would be brand new and all of this would happen by mid-November before Lynn and her husband planned to leave for a much needed getaway. Knowing that I would be out of town for several days before our week to go live, I had to ensure that the operation would proceed without a hitch during my absence. The realtor was kind enough to have my back. Early in the morning on Saturday, October 28, Lynn and her husband dug in once again to remove as much as possible in preparation for the move and initial cleaning by deciding what would go to the new apartment, be sent to Lynn's home, or disposed in one way or another. Covenant Clocks safely delivered the heirloom to its new home and the cleaner's first stab allowed the movers to proceed without a hitch on cardboard covered flooring 2 days later. With the furniture and most of the items mom wanted retained out of the condo, we could move forward on additional clearing out. It also came to our attention that the countertop, floor tiles and grout would need some extra TLC. They were heavily stained and a regular cleaning would not suffice. After some research, I set an appointment with Grout Masters to begin on November 1. While their initial process made a significant difference, colorant would be needed to ameliorate the hue differentials due to the staining. The process is pain-stakingly laborious. Grout Masters quickly contacted the colorant company in Texas to have the product sent asap. The handyman worked throughout the weekend of November 5-6 completing most of the painting days ahead of schedule allowing him to address some of the other tasks and paving the way for the carpet installer to take over along with the application of the grout colorant. The grimness that I know that Lynn had been feeling just a few days before began easing as I relayed the signs of the tunnel light. 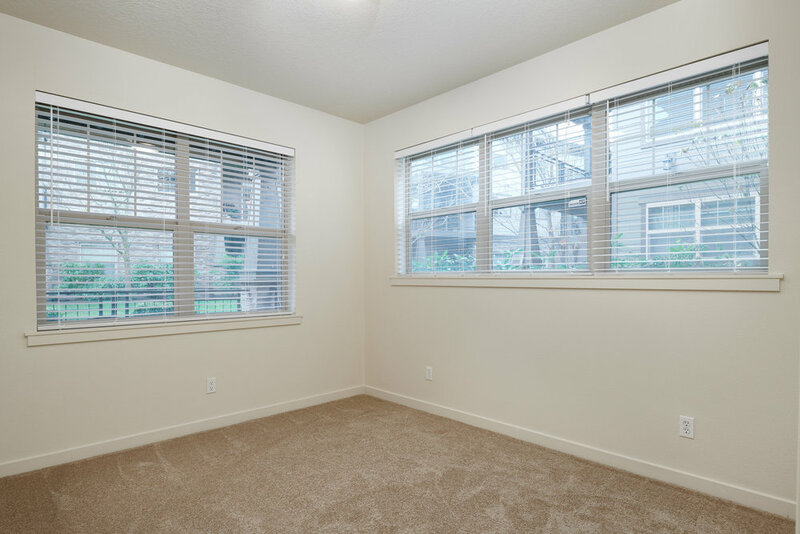 The difference with a fresh coat of paint, pristine carpeting, shiny new blinds, and then the coup de grace a suite of new appliances is difficult to articulate. Again, during our final week, the fates were on our side as we had no idea until the night before the appliance delivery when our 4 hour window would occur. My hope was that the housecleaners who were scheduled for a 1:00-3:30 time slot would be present so that as the appliances were removed they could scour and disinfect those areas. The delivery crew arrived right on cue. 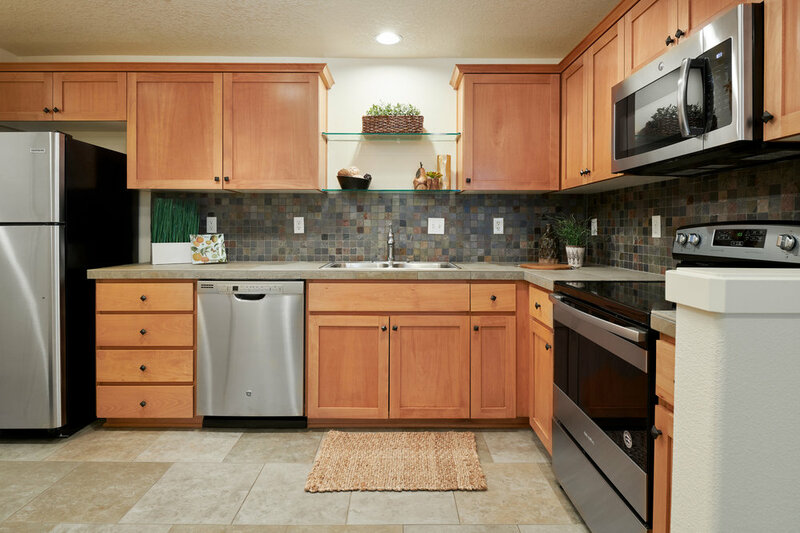 The final kitchen renovation was completed within a matter of hours. A few slight hiccups happened along the way such as the insistence that the microwave would not fit in the space, but somehow it eventually slipped into place. The next day I arrived late in the afternoon to find that the realtor had staged both the interior and exterior and the photographer was concluding his stills and video for the marketing materials. At that point, I was completely overwhelmed with emotion and immediately began texting Lynn the astonishing photos. We both cried. This is an excerpt of a text I sent to Lynn that I feel obligated to share because none of this could have or would have happened without each and every person involved going so far above expectations to enable the home to hit the market on the date we set weeks before. Marty Thomson, the handyman was at my beck and call each time I found something that needed to be addressed. He endured long hours to very capably handle the long task list. Leo Sanchez worked this project at night to remove the old carpet, install the new carpet, and then to install the toilet. Jessica Barber of Grout Masters stayed until 11 pm one night to ensure that all the grout lines were uniformly painted to eliminate the color variations due to stains. Sabrina Hundley, Debra Scowden, and Chris Isley of Executive Choice Cleaning meticulously scoured and polished every surface. David Valencia and his crew from Lile Moving and Covenant Clocks safely and securely moved all the treasured possessions despite the obstacles with which they contended. Go Trashy's prompt responses and willingness to help out time after time allowed us to keep the project moving apace. Marianne Thelin of the Meadows Group Realtors never gave up hope and patiently handled my calls peppered with trivial inquiries and requests. Her staging flair brought the kitchen, bathroom, and back porch to model home life. And she expeditiously sold the property for more than we dreamed possible. Her photographer Shane McKenzie deserves kudos as well for capturing the best that the property has to offer. But most of all, my heart and deepest appreciation go out to Lynn and her husband for their fortitude, diligent work, and never giving up on the process even when times were at their bleakest. And a special thank you to Lynn's mom for allowing me into her home, for moving forward when she clearly would have preferred staying put, and for the opportunity to bring this incredible group of people together in a way that we would have never anticipated. On a final note to the story, less than 4 days on the market, Lynn accepted an offer significantly above asking price and accompanied by a backup offer also above asking price. Were there miracles that took place? I feel like there were many. Was there divine intervention? Does it really matter? I am humbled and grateful. 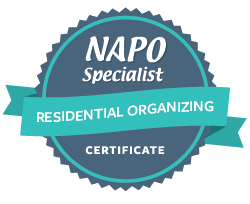 If you need help making your organizing wishes come true, contact me at sherri@thepracticalsort.com or schedule your 30 minute free phone consultation at thepracticalsort.com/contact. Happy holidays and may your days be filled with miracles, gratitude, and love.